Festival Madness – Fire & Water finishes first! 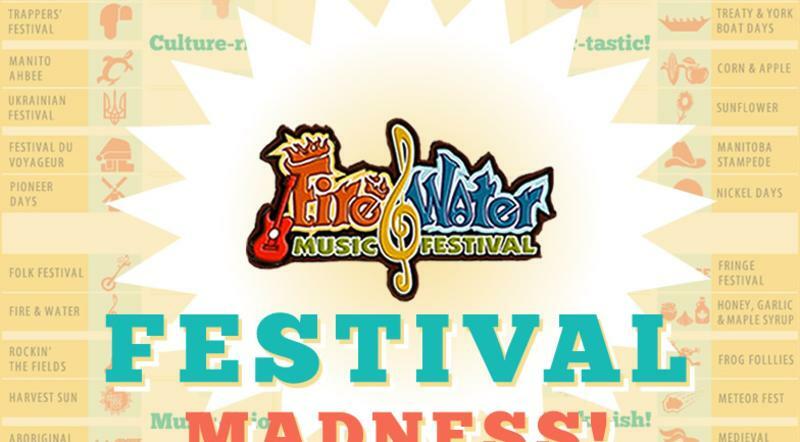 The votes are in and the winner of Festival Madness is Fire & Water!!! Maybe it’s fitting that a festival with the word “fire” in its name is the one that actually caught fire in the competition. We are Manitoba’s fastest growing, family-friendly music festival that is perfect for all ages. We’ve got something for everyone in your family – from the youngest to the oldest – with our great collection of artists playing everything from roots country to metal. The Fire & Water Music Festival features some of the best up-and- coming Manitoban Musicians, with a sprinkling of Canadian and International performers to help give the festival a little spice. With three stages of music, artist workshops, children’s programming that is fun for all ages, unserviced RV and camping spaces, the ArtWave Art Show, the Artisan Square Craft and Trade Show and so much more, this is one festival you won’t want to miss. The festival is August long weekend, July 29, 30 and 31. Thank you all for participating and sharing your love for Manitoba’s festivals. It’s been a fun week full of upsets, shocking defeats and wild come-from-behind victories. We’re thrilled with how many of you got behind this “just-for-fun” competition. Over 37,000 votes cast! Amazing. High fives all around. A huge shout out goes to the Medieval Festival and their many knights of the realm! They were an honourable finalist.